Atlanta, GA, July 21, 2009 – IDology, Inc., a leading provider in identity and age verification solutions, has earned the Kansas Division of Alcoholic Beverage Control seal of approval. The Division of Alcoholic Beverage Control, a sector of the Kansas Department of Revenue, named IDology an approved vendor of identity and age verification services for direct wine shipments early this week. The approval comes under new Kansas law that allows residents to order wine from out-of-state wineries holding special shipment licenses. The licensees are required to validate that customers are of legal age using an approved identity and age verification provider. IDology was added to this list after being approved through a process of product review. 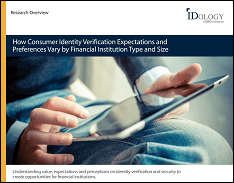 Kansas is the second state to recognize IDology as an approved vendor of age and identity verification services. Michigan added IDology to its list in 2006. IDology, Inc. provides real-time technology solutions that verify an individual’s identity and age for anyone conducting business in consumer-not-present environments to help drive revenue, decrease costs and prevent fraud. What makes us different is that we do this in a way that builds more confidence with your customers – by protecting sensitive data and promoting consumer privacy. Founded in 2003, IDology is the only provider to offer an on-demand change management tool that allows client business-unit managers to control the entire proofing process, including within an integrated solution, without having to rely on internal IT resources or contact IDology’s customer service. For more information, visit www.idology.com or call 866-520-1234.